In addition to the use as a lock screen widget, DashClock can as well be used as a regular home screen widget. The extension is applicable for all sites in the Stack Exchange network and only needs the User ID. 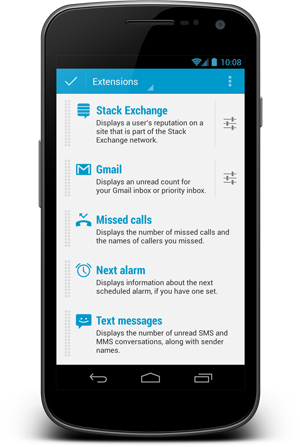 The extension can be downloaded from the Google Play Store. It requires the DashClock widget by Roman Nurik. Android 4.2+ – unfortunately, older versions of the platform can not be supported as long as DashClock itself is only available for 4.2 and above. After you downloaded and installed DashClock and Stack DashClock Extension, add the DashClock widget to your lock screen and/or home screen. Open DashClock's settings, navigate to section Extensions and click + Add another extension. Enter site and user ID and you're done! Browse other questions tagged app android widget extension .